AP International is pleased to announce the release of the new Ray Ross™ Bass Bridge, a retrofitting bridge that represents a revolutionary approach to the standard stringed instrument bridge design. Rather than utilizing a traditional saddle to provide a string break, the Ray Ross™ features a tone pin that keeps the string completely straight from the bridge to the nut; this concept removes the “kink” from the string, providing increased vibrational energy through the strings and into the body of the instrument. This feature allows maximum transference to the instrument so you can get the most of the bass itself, not solely the color of the bridge. Comprised of solid brass, the residual tone you do get from the bridge is articulate, resonant, and full-bodied. On a standard bridge, downward force applied to the instrument from the string is restricted due to the saddles providing relief between the string and body. The Ray Ross™ negates this concept and applies nearly 100% of the string tension downward allowing the string to resonate freely, giving the cleanest possible path from your fingertips to your ears. Height adjustments are done via a lateral action adjustment wheel that raises and lowers the tone pin and retains full connection from the string to the bridge plate. An intonation lateral adjustment wheel allows for painless macro and micro adjustments while also preventing the saddle from moving over time. 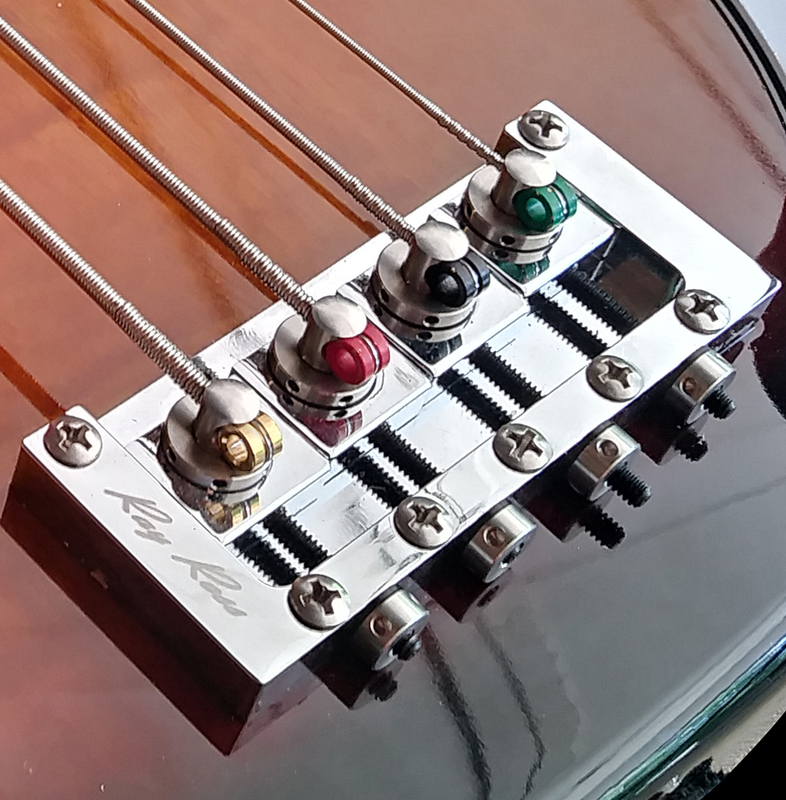 The Ray Ross™ Bass Bridge gives ultimate mounting flexibility with seven screw holes to choose from including the spacing of Fender’s 5-hole design, making it a perfect retrofit for the multitude of Jazz and P-Bass style instruments on the market. A 2 ¼ inch (57 millimeter) string spacing matches many standard bridges. Check out the new RayRossBridge.com for more information!